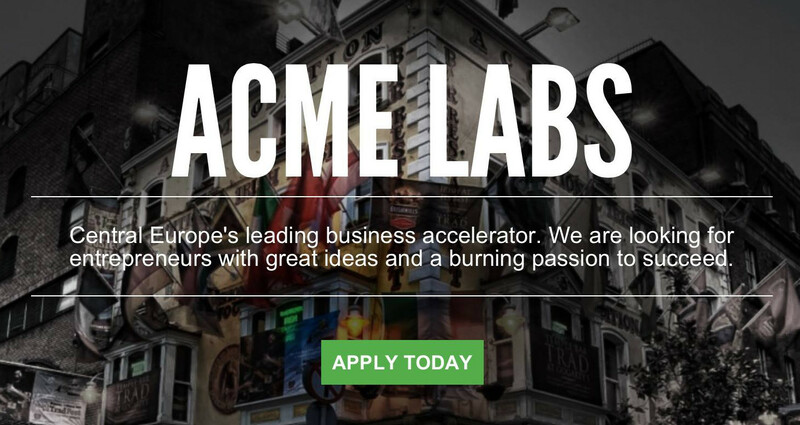 Acme Labs, a new accelerator in Budapest, announces that they are accepting applications for their inaugural spring 2014 program. Applications are due by November 8th, so there is still quite a bit of time to apply, and the program will run from January 13th to April 11th next spring. Founded by Gyuri Karady, Chris Farkas, Glenn Thomas, and Krisztina Tolnai, the accelerator reports that they will invite the most promising teams to Budapest to meet with them from November 18-22. Then, within a week, they will offer a term-sheet and expect that teams will move to Budapest to begin establishing their business if they have not already done so. Acme Labs does not disclose the terms that they are offering applicants but seem to have already developed some solid connections, listing Microsoft (BizSpark), Google Hungary, Central European University, Corvinus University of Budapest, and American Chamber of Commerce in Hungary as partners. Companies currently listed in the Acme Labs portfolio include EEGL Interactive, Stereocake, Crossway Media Solutions, and shinrai. Several months ago, we did a big post on the Hungarian startup ecosystem as a whole. In addition to Acme Labs, Budapest-based accelerators include Kitchen Budapest (which launched Prezi, a company with more than 10 million users), Colabs, iCatapult (about whom we have previously written here), and SeedUp.